Let's face it - candy is always a hit. 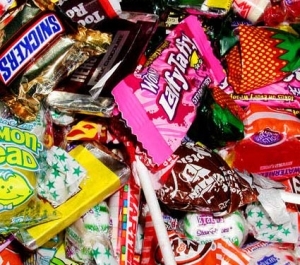 Even those "dieters" who decline the offer will be secretively happy taking home candy party favors. A little sugar never hurt anyone, right?! Buy your own candy and party favor supplies and assemble on own. Create candy wrapper party favors by either printing your own labels for a candy or purchasing them. The ever-popular custom candy bar wrappers which are generally better when ordered from a professional company. Below you'll find a bit more detail about each option above. First, decide upon the type of candy you wish to use. Examples - for mardi gras, you might use colorful M&Ms; for a baby shower you might use a regular-sized plain Hershey Bar; for a 50th anniversary party you might use chocolate coins wrapped in gold foil. Next, decide how you want to package the candy. Is it going to be one single piece? Do you need a bag or box? If you choose a bag, will it be cellophane or paper? If you choose a box will it be square or shaped? Finally, decide how you wish to accessorize the favor. Will you use a ribbon to tie your favor closed? Will you attach a tag to the favor with personalized information? For all these matters, be sure to see our general party favor ideas page. If you don't have the time or inclination to assemble your favors on your own, there are plenty available for purchase that fit the candy theme. Whether you are going to use candy wrapper party favors or custom candy bar wrappers, the following items will give you an idea of what you might be looking to buy. If you are looking for something different than what you see, just click on any of these links and you'll be able to search the entire product line. Back to Edible Party Favors. Return from Candy Party Favors to Home.